There is a real crisis in our classrooms. Many legislative Republicans argue that empowerment scholarship accounts, Arizona's school vouchers, are the best solution to that crisis. But here are a few facts one state senator left out of her recent letter to the editor defending vouchers. Of the $9,500 per student that Arizona public schools receive, less than half comes from the state. The fact is that the Republican-led Legislature is still neglecting public school funding; suggesting otherwise is misleading at best. Arizona is still ranked 48th in the nation for per-pupil funding, and that ranking includes federal money. The vouchers that Republicans are pushing divert money away from our already-starved public schools, and our kids deserve more. At the same time, we have seen reports that voucher dollars are not being used to help kids in need. Instead, affluent families are using vouchers to send their kids to private schools. That’s not what the program was supposed to do, and Arizonans received more evidence this year that voucher oversight is dreadful. 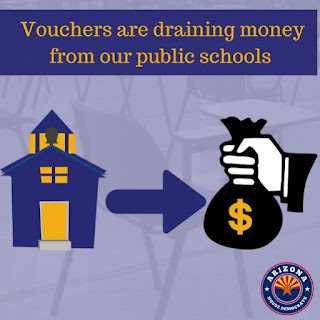 The fact is that vouchers undermine our public schools—the ones that most of our kids attend. Instead of expanding voucher programs, the Legislature should be investing in our public schools and their teachers and students. In fact, members of the Legislature have a constitutional and moral responsibility to support the public education system that serves a vast majority of Arizona’s students. Yet, instead of fulfilling this responsibility, legislative Republicans have turned their backs on it. And since Republican lawmakers continue to push for ESA expansion without true oversight, parents are now working together to try to stop the expansion of this seriously flawed program that helps private schools at the expense of public schools and all public-school students. This legislative session, thousands of Arizonans voiced their support for public education. Please click here to find ways to add your voice in the fight for public education at the Legislature.